S. Max Edelson, The New Map of Empire: How Britain Imagined America Before Independence (Harvard University Press, 2017). Jennifer Ford ed., The Hour of Our Nation’s Agony: The Civil War Letters of Lt. William Cowper Nelson of Mississippi (University of Tennessee Press, 2007). 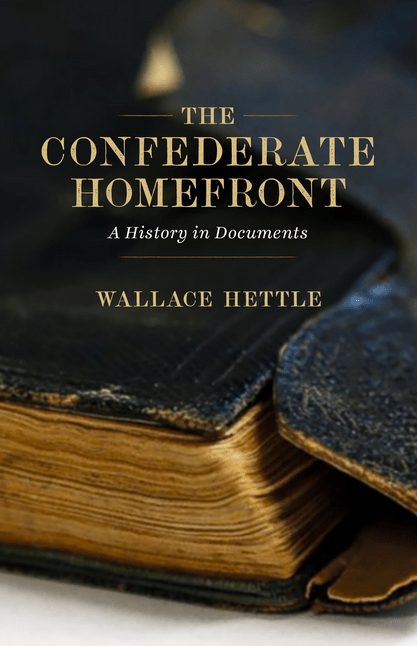 Wallace Hettle, The Confederate Homefront: A History in Documents (Louisiana State University Press, 2017). Robert G. Parkinson, The Common Cause: Creating Race and Nation in the American Revolution (University of North Carolina Press, 2016). Carol Reardon & Tom Vossler, Gettysburg: Experiencing the Battlefield through Its History, Places, and People (University of North Carolina Press [2nd edition, 2017]). My mother’s great grandfather, Nathan Cordray, was the 1860 census enumerator for White Eyes township in Coshocton, Ohio, and had moved from Upper Old Town in Allegheny, Maryland to the Tuscarawas River valley in Ohio when he was ten years old, shortly before the War of 1812. His wife appears to have been born on the Tuscarawas in 1803, possibly the daughter of an American military officer and an unidentified Lenape woman. I looked in the index and White Eyes is mentioned multiple times. This is a massive book and I am only 150 pages into it, but it is fascinating. My focus is primarily the 19th century and I have read and written extensively about the fears of slave insurrection, but Parkinson’s book extends that narrative back to the Revolution. In that sense the book follows Manisha Sinha’s latest on abolitionism by filling in important gaps and extending a narrative back into the late 18th century. Next post: Do Gettysburg’s Confederate Monuments Perpetuate the Lost Cause?